Or, what the heck, do as I did and make a few of these for dinner to use up a little nubbin of brie that’s left over in the cheese bin. Serve with a crisp green salad, of course. Tiny Grilled Brie and Apple Panini: Slice a baguette crosswise into very thin slices. Spread each slice thinly with butter. Cut thin slices of brie and even thinner slices of a sweet, crisp apple. Heat a griddle or wide pan over medium heat, then build your sandwiches right on the pan (unless you’re making a lot of them, in which case I’d prepare them in advance and keep them on waxed paper). Place a baguette round butter-side-down on the pan, then a slice of brie, then a few slices of apple, then the top piece of bread butter-side-up. Cook until the underside is golden, then use a thin spatula and/or tongs to flip and cook the second side. 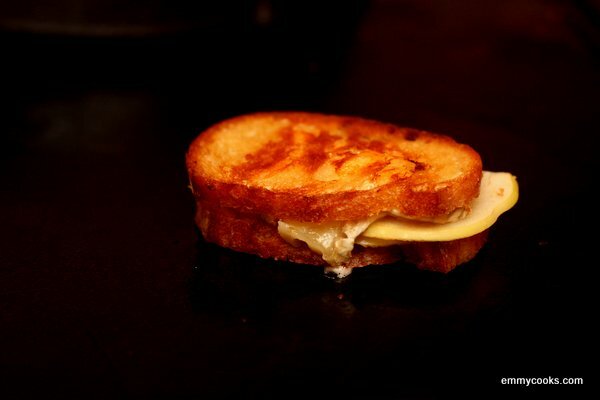 If your cheese is not as melted as you’d like when the bread is nice and toasty, return to the first side for a minute until the cheese reaches oozy perfection. If you assembled the sandwiches in advance, I still recommend cooking them with the cheese layer closest to the grill first, so that when you flip them the apple joins the bread in supporting the now-softened cheese. This will let you use even a good baguette with a nice open crumb structure. Once both sides are golden, you can flip the sandwich cheese side down for a moment to let some of the cheese seep through and brown if you’d like. This entry was posted in Easily Multiplies to Feed a Crowd, Food, Fruit, Recipes, Sandwiches, Snacks and Apps and tagged apples, baguette, brie, es, grilled sandwich, sandwiches, vegetarian on November 27, 2012 by emmycooks. Lovely. I should not be reading this before getting out of bed! Oh, I disagree. I think they’d make an excellent breakfast! Wow. These look goooood. I think I would classify them as anytime food. Breakfast, lunch, 4am, hungover. Thanks for sharing! That is such an excellent idea. Luckily I’m just leaving to go to the boulangerie – I shall have to pick up some brie as well. Aren’t those cute? We made similar with leftover cranberry sauce and mustard the other day (seen on Joy the Baker) and they were grand. I loved grilled sandwiches with apple. Another awesome choice for cheese is goat gouda……..mmmmmmmm. Give it a whirl and tell me what you think. My favorite cafe when I was in college did something similar to this, with apricot jam instead of apples. It was by far my favorite sandwich. You’ve inspired me to try and recreate it at home this week! Shoot, I don’t think I have any apricot jam left! But I always love an excuse to buy jam, and this sounds like an excellent one. :) I lived in Denmark for a year in high school and always loved the cheese-and-jam sandwich combination, it’s definitely a favorite snack of mine and I love finding good new combinations. Thanks for the tip! I was thinking of you when I clarified, I’m glad you don’t seem too put out. :) I have NOT tried brie and roasted red pepper but I certainly will soon. As crostini, I assume? Melted? With basil? Oh that looks so good! I want to try this, except with pears instead of apples. Yum! That sounds good too! Another favorite combination of mine is stilton with sauteed pears–usually as crostini rather than sandwiches. Mmm. Sounds heavenly, and since I’ve finally made some meltable cashew cheese, I just might be able to approximate this heavenly bite. Thanks! Oh, these are brilliant! They would be lovely with champagne, wouldn’t they (although, really, what wouldn’t?). It’s so nice to have a repertoire of simple yet elegant things to serve when people come over. I agree that good-with-champange is a low bar. :) And also that easy is the name of the game when it comes to entertaining!